On Monday, the Google Earth Outreach team hosted a workshop for Bioneers participants who wanted to get their hands dirty with the tools they saw at Sunday's Google Earth Outreach plenary and afternoon sessions. 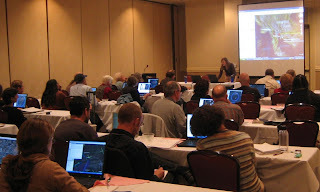 We guided about 70 attendees through the processes of creating a custom My Map, building a Google Earth layer, and using the Spreadsheet Mapper tool. In the afternoon, we split the group up into beginners and advanced techies, so we could better train them on the tools and answer their specific questions. People came from organizations that work in conservation, social justice, and sustainability, like Planetary Coral Reef Foundation, Marin County Search and Rescue, Woodbine Ecology Center, Center for Sustainable Building Research, Mendocino Land Trust, and Forest Trends. We also had some fantastic guest presentations. Tim Sinnott, GIS Manager of Greeninfo Network, presented some of the content that Greeninfo has created for Google Earth, including a KML layer used to help stop the expansion of a landfill into Marin County wetlands. Brian Hamlin, an independent developer, followed his GeoDeveloper Series talk, and demonstrated how to create dynamic with PostGIS database and GeoServer. Also joining us was Rosalyn Mahashin from Google Grants, who introduced the participants to the grants and opportunities available to non-profit organizations, such as Google Grants and Google for Non-Profits.